Adams’ historic fourth Annual Message to Congress—now known as the State of the Union Address—announces the establishment of the District of Columbia as the nation’s capital. The second President, who had just been defeated for re-election, optimistically discusses unprecedented economic growth, considers the recently consummated treaty of amity and commerce with Prussia, and focuses on the need for expanded naval forces and coastal fortifications, which he believes to be necessary given the Quasi-War with France. A rare broadside extra edition: no institutional copies are listed in OCLC, although it is possible they exist in uncatalogued runs. The National Intelligencer, then in its second month in print, had moved to Washington at the behest of President-elect Thomas Jefferson. [JOHN ADAMS]. 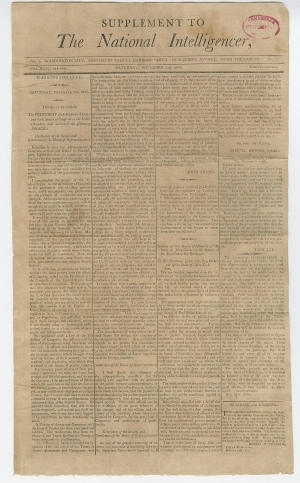 Broadside, Supplement to the National Intelligencer. [Washington: Samuel Harrison Smith, November 22, 1800]. Expected folds, light creates, library stamp at top right, else fine overall.